The single-A Columbus Red Stixx took an early lead in this May 1992 game and they did it on the bat of Sam Hence, according to The Savannah News-Press. Leading off the third inning, Hence launched his second home run of the year, giving Columbus a 1-0 lead, The News-Press wrote. Hence's was a career that began two years earlier as a 39th-overall pick of the Indians. But he could never live up to that high selection. He played in a total of six pro seasons. He never made AA. Hence's career began in 1990, taken by the Indians directly out of Stone County High School in Mississippi. At Stone County, Hence lettered in baseball, as well as football and track. In track, he held the state record in the 200-yard dash. With the Indians, Hence started at rookie Burlington. He hit .216 in 35 games. He picked up three home runs and 11 RBI. He returned to Burlington for 1991, then Columbus and short-season Watertown in 1992. He started 1992 at Columbus, scoring in a late April game. Hence played at Columbus full-time in 1993, hitting .299 in 88 games. 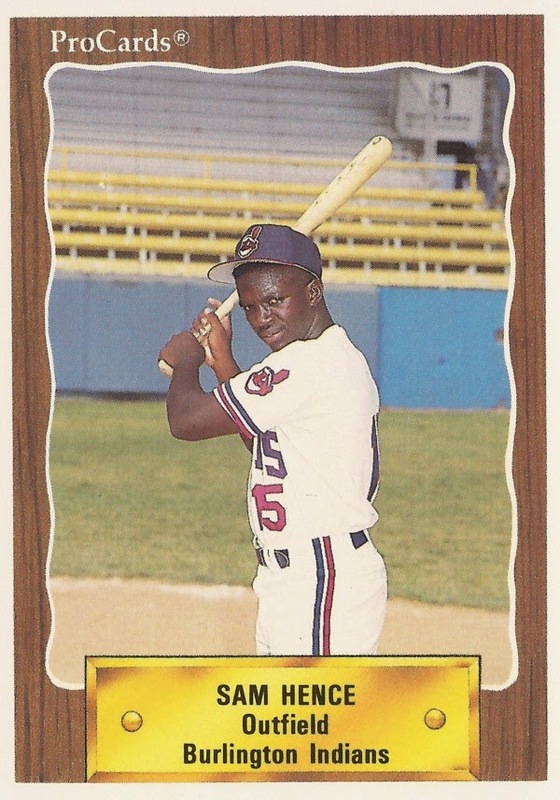 He hit high-A Kinston in 1994, but his average dropped back to .224. He got into four more games in 1995 at independent high-A Bakersfield. They were his final four games as a pro.